Live Oak Hill, Texas, AKA Hostyn Hill, Texas. Joseph Ehlinger, an immigrant from Alsace-Lorraine, France, who was granted 960 acres for military service in Houston's army, built a cabin in 1850 in a live oak grove on a beautiful hill 1 ½ miles northeast of the present town of Ellinger. Ehlinger drowned in Buffalo Bayou, but his family lived at this site. German families soon moved to the locale, followed by Czech settlers. Ehlinger's son, Charles, a successful businessman, owned a general merchandise store, blacksmith shop and gin at the foot of the hill, hence the name of the town - Live Oak Hill. Eventually, two more general merchandise stores were built, along with three blacksmith shops, a wheelwright, saddle and tin shops, a dance hall and Czech school. St. Joseph's Catholic Church, the oldest Catholic Church in the county, was moved to the top of the hill from Ross Prairie in 1861; a Catholic cemetery was established next to the Ehlinger family cemetery. 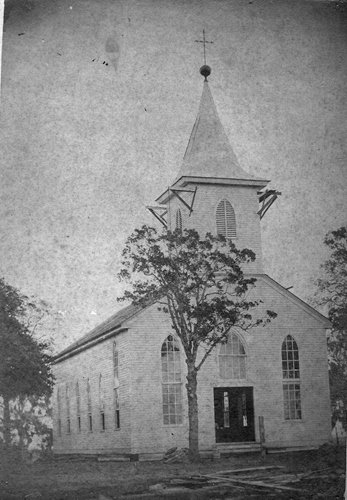 A larger church was built in 1865, followed by another in 1879, when the name was changed to St. Mary's; it burned in 1905; the 1906 church still stands. The site was re-named Hostyn Hill by the Czech settlers. Several schools were built here; the last school closed in 1932, but served as a parish center until a new center was built in 1984. The town of Live Oak Hill moved to the new townsite on the railroad that was renamed Ellinger in honor of Joseph Ehlinger. 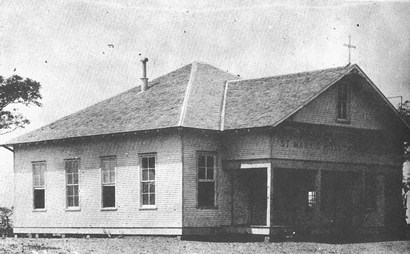 The church and a school remained at the original site next to the cemetery. The church is now known as St. Mary's at Hostyn Hill near Ellinger.